Welcome to The 6th Day of Christmas hosted by Focused in Fifth. Today we are sharing the holiday products we can't get through the month without! 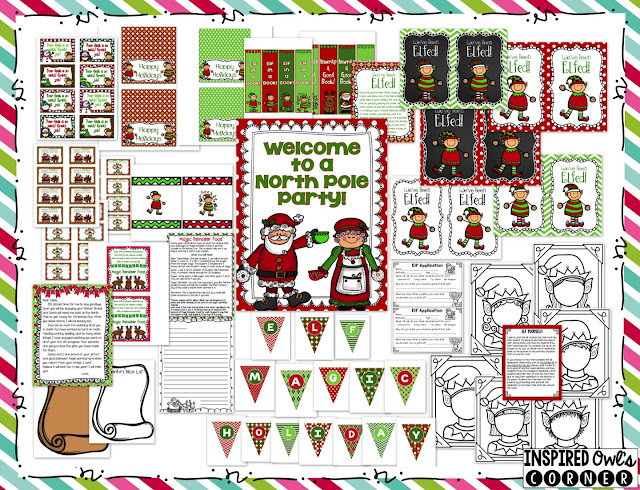 Yesterday I shared my classroom elf freebies that I use in my classroom. In addition to those ideas, I also have my students write about our elf. 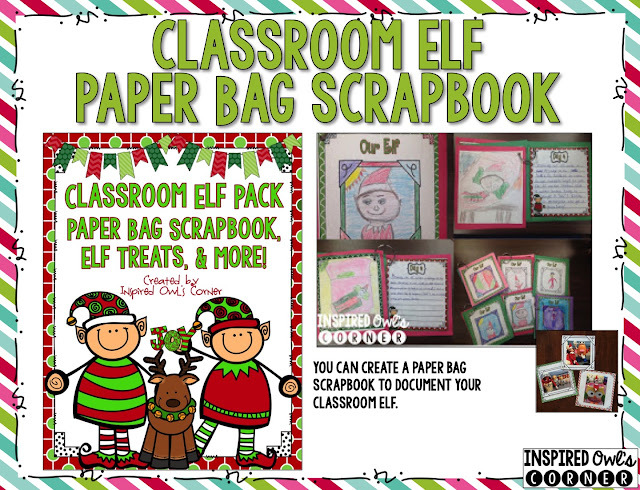 Last year we made a class paper bag scrapbook to document our elf's antics in our classroom. Paper bags are perfect for a project like this because when you fold them and staple them to create the book, the open sides create pockets for extras like pictures or extra space for writing. 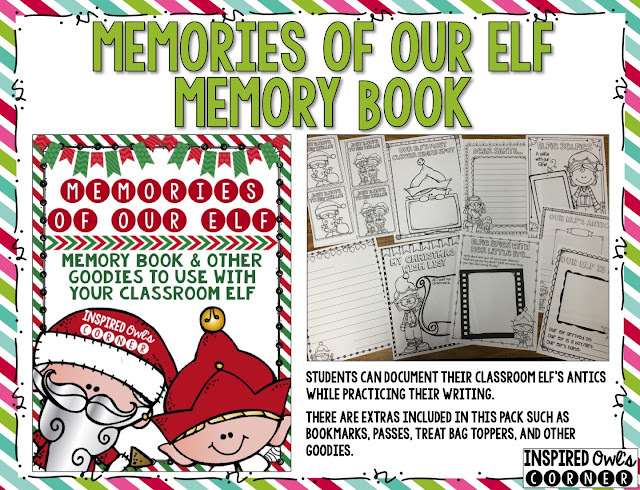 This year we are documenting our elf's arrival, his daily antics, and other happenings in our classroom in a memory book format. My students need lots of extra practice with writing. This will make a great keepsake for the students and their families to reflect on. 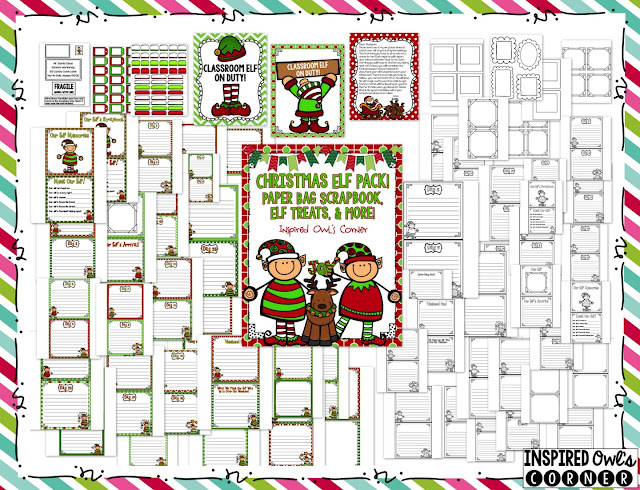 Both packs also have extras like bookmarks, passes, and treat bag toppers that can be from you or your elf. I love the reading passages below from PAWSitively Teaching! 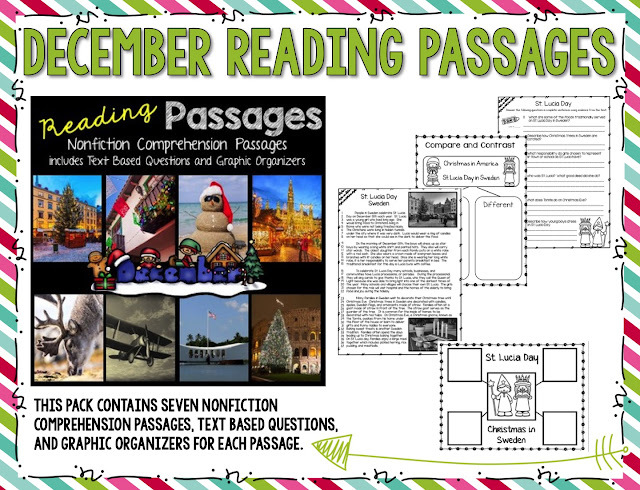 She has included seven comprehension passages with a December theme, comprehension questions for each passage, and graphic organizers that go along with the passages. These are going to last me all month since we spend a long time reading and rereading them. My students have to find evidence from the reading to support their answers, and they love using their markers to color code their answers. These passages are just great! You can see her freebie for this file here. Click on the picture below to see the entire December pack. 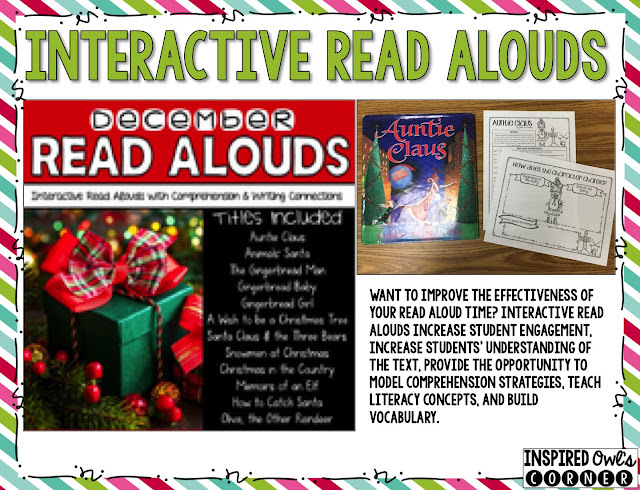 The December Read Alouds below also from PAWSitively Teaching are fabulous! 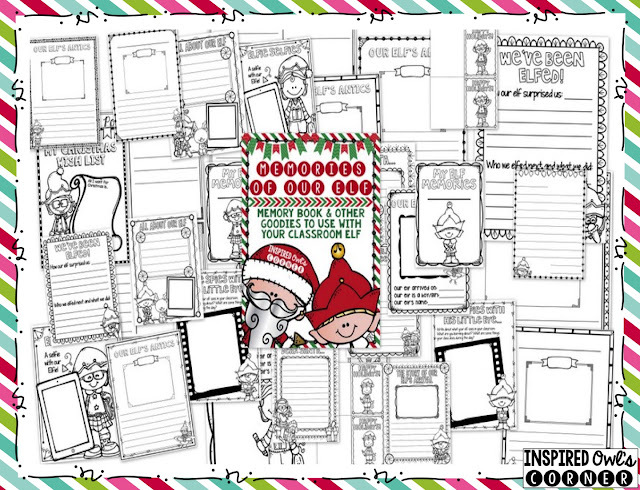 She has included eleven holiday books with comprehension questions to ask as you are reading aloud to your students. It's such an effective use of read aloud time! 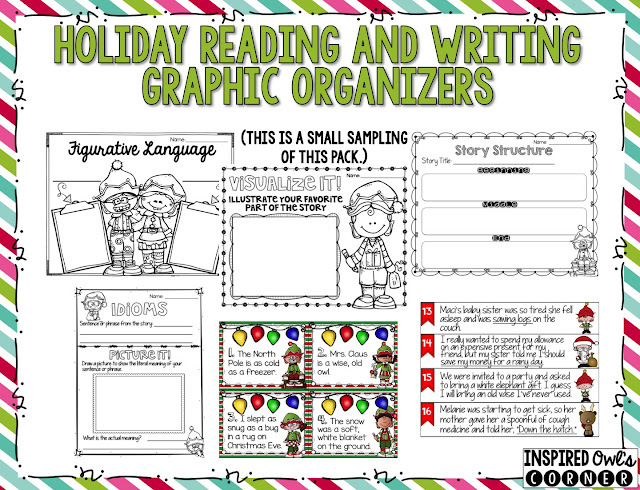 She has also included graphic organizers in this pack to use an an extension. 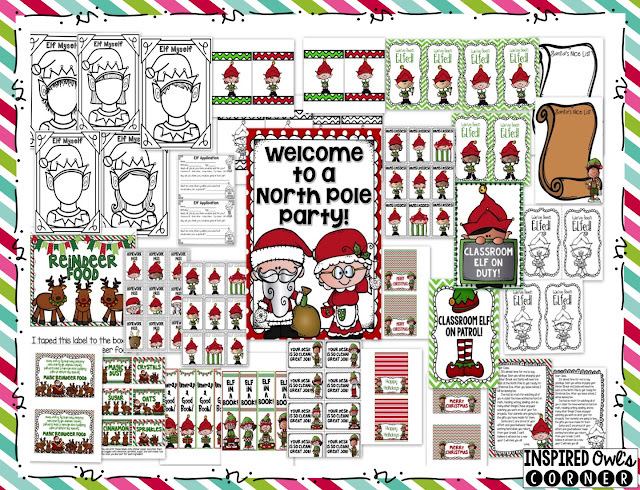 Click here to see her freebie, and click on the picture below to see the entire pack. I love teaching with mentor texts. One of my favorite for the holidays is Memoirs of an Elf. There are so many wonderful teaching opportunities with this book! It's filled with similes, metaphors, idioms, compound words, story structure, sequence of events, cause/effect, fact and opinion, and problem/solution. I have a blogpost of ideas for using the book here. You can also find a simile and metaphor freebie from the pack here. 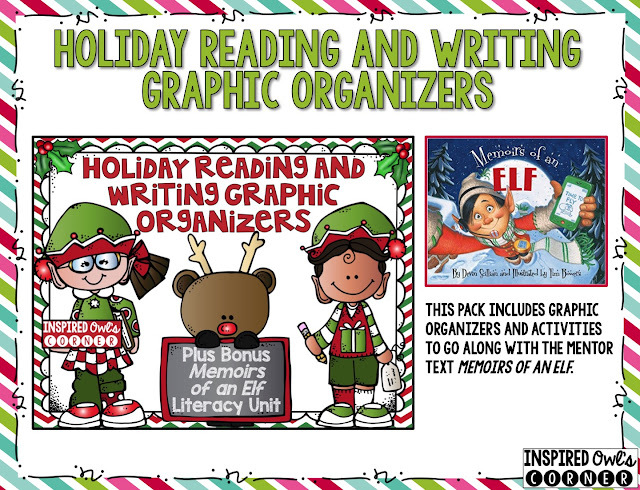 The file below consists of graphic organizers to use with any book, and a pack to use with Memoirs of an Elf. My students are finally independent enough to work in centers together and stay focused. This allows me to work with groups or individuals, and I can feel confident that the rest of the class is practicing the important skills they need to to know. 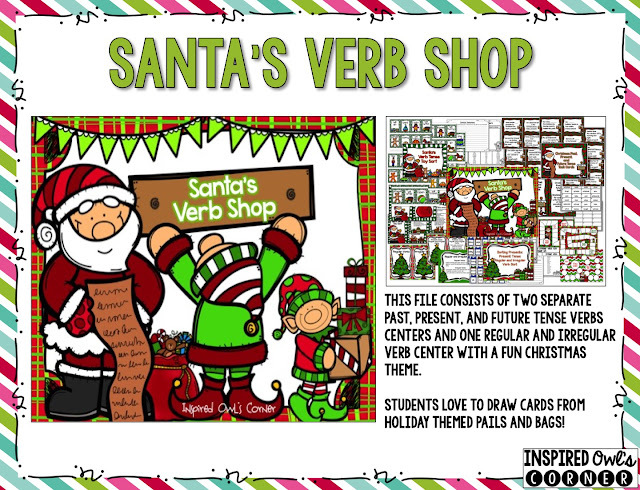 The pack below covers verb tense and regular and irregular verbs. 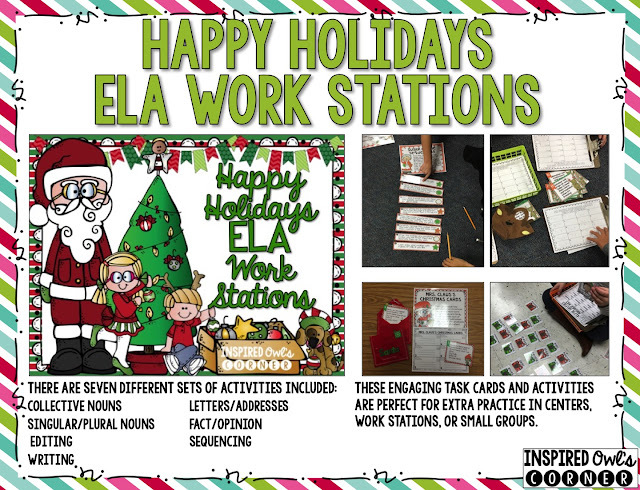 Last week we began the Happy Holidays ELA Workstations shown below. The students flipped over them! They loved the felt holiday bags that held the task cards. I couldn't believe how focused even my most unfocused students were! They practiced fact and opinion, sequencing, collective nouns, letter and address writing, singular and plural nouns, and editing. They are perfect for students to work on together, with a volunteer, or the teacher. Would you like to win all of the products I've shared? 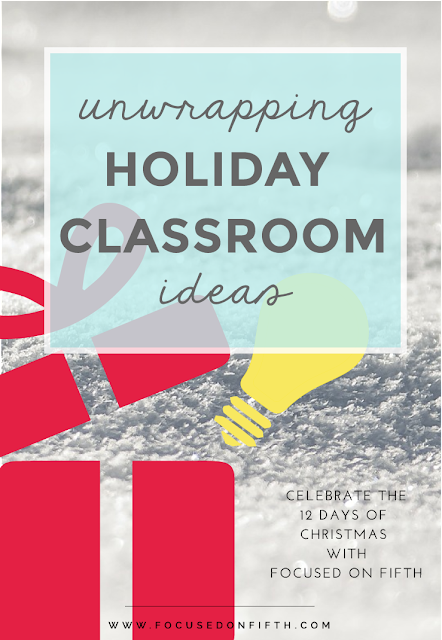 Leave a comment about your favorite thing to teach in December and your email, and I will choose a winner tomorrow. Visit PAWSitively Teaching's blog for a second chance to win all of these products and the products she has shared too! So this is what December looks like in my classroom. What products are getting you through this month? We would love for you to link up and share your ideas! You can also click on Focused in Fifth's blog button below to see the schedule for each day of this linky. Thank you for joining me today, and enjoy your Sunday! I love teaching using our classroom elf but have also really enjoyed my Gingerbread lessons this year! There are some really great Gingerbread stories out there! I like teaching about holidays around the world. It allows students to experience and learn about new cultures and traditions in a way that broadens their thinking. Thanks for the opportunity!